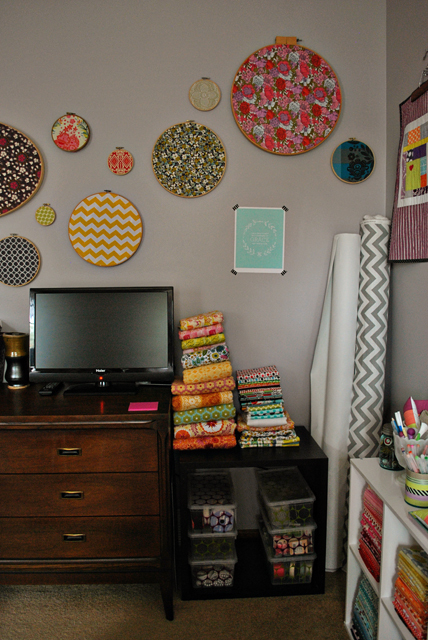 Bijou Lovely: sewing room tour. 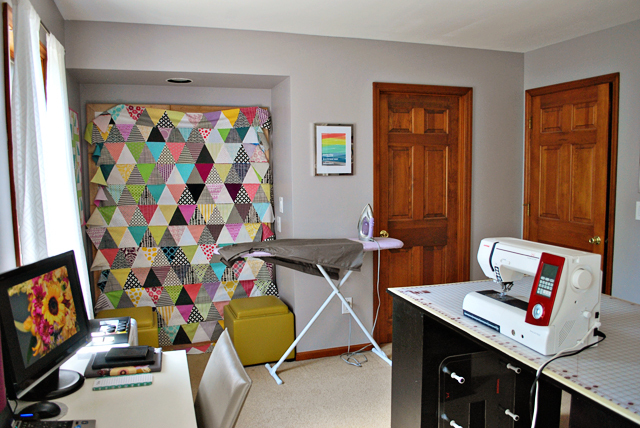 I made sure to take some pictures of my sewing room while it was all cleaned up last weekend! Would you like to look around? Here's the view when you walk in the door. 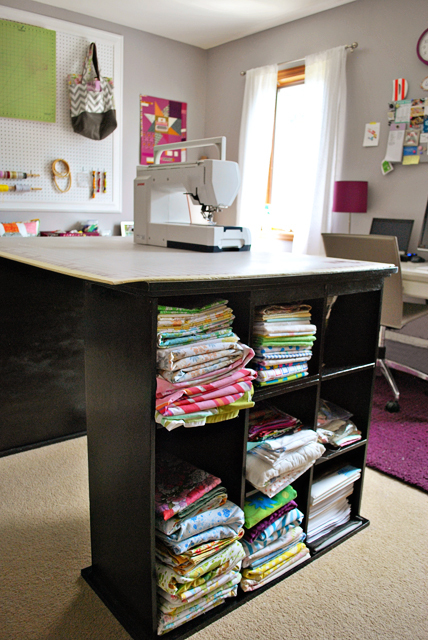 The table in the center of the room is used as both my cutting table and sewing table. 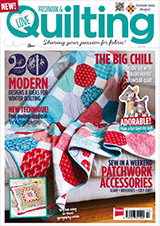 I also baste my quilts on it. My husband built it for me as my wedding gift when we got married! It's big enough that I usually don't have to take my sewing machine off unless I'm cutting a lot of yardage. I wish the top was a bit bigger so the cutting mat fit completely, but this works for now. We might replace the top with something larger down the road. Behind the table on the long wall is my new pegboard! I asked my husband if he could frame out a piece of standard pegboard in pretty trim to dress it up a bit. This is the newest addition to the room, he just installed it a little over a week ago. I hang my rulers, scissors, cutting mats, and washi tape on it, among other things. All the things that I use a ton that aren't very easy to store elsewhere. As you can see I still have lots of room to spare here. I've hung a few mini quilts along this wall as well, my improv mini from Sewing Summit last year and the awesome typewriter mini from Jen. 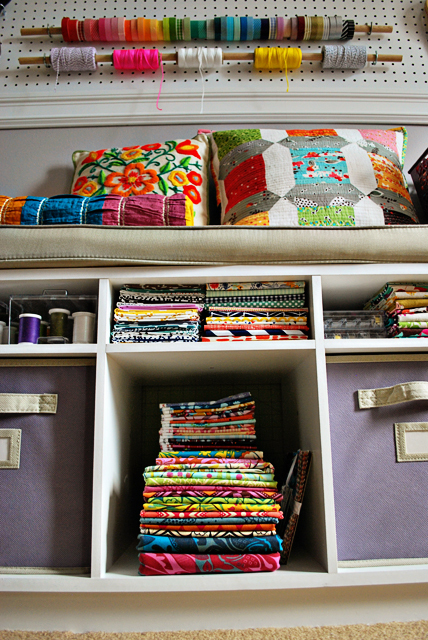 Of course my fabric stash sits along the bottom of this wall as well! Batting and home dec fabrics are stored in the corners, mainly because I don't have anywhere else to put them. 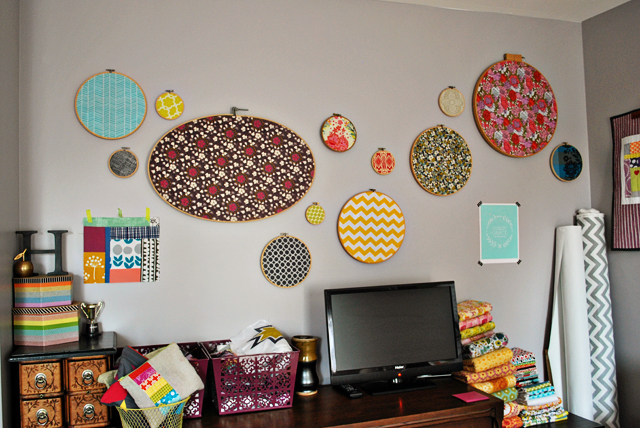 If you turn back towards the left, you'll see my embroidery hoop art! Lots of my favorite fabrics are framed here. A long dresser I thrifted last year sits along this wall and holds all of my shipping supplies, along with paper and paint. Eventually I'll switch it out for a similar dresser that's white, but it's still half painted in my basement and I don't see myself finishing it anytime soon. Turning back towards the door, you can see my design wall and ironing board setup. My husband built the design wall too, it's just some plywood framed out with a reclaimed wood frame and wrapped with a layer of batting. The ottomans in front of the design wall hold all of my work supplies and folders, and offer a place to sit in case anyone wants to visit me (which doesn't happen often in here!). 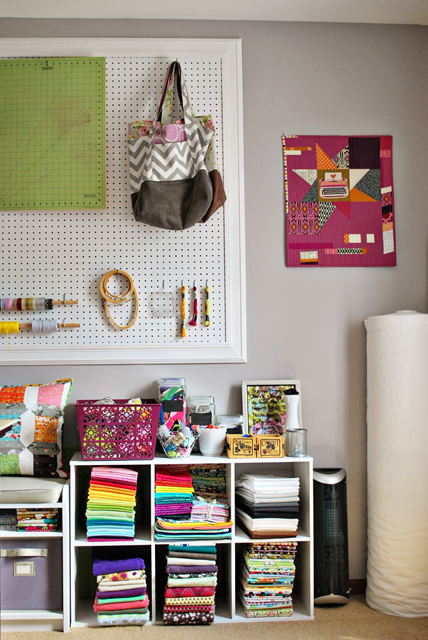 The door near the ironing board leads to a small walk in closet with more craft supplies. Here's where you can find me most of the time during weekdays. Parked in front of my desk and computer screen! The board on top holds my to do lists, business cards, sketches and such. This is where I'd actually prefer to be on weekdays... sorting through my fabric stash! Yardage of all of my prints are stored on this side. 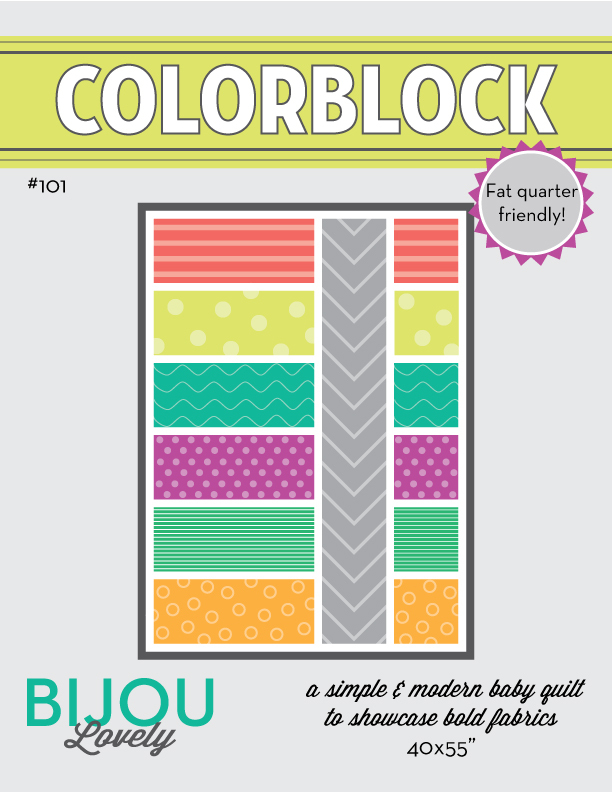 Solids and fat quarters are stored in the top of this side. 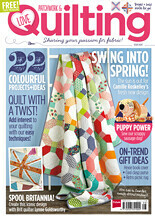 Linens, flannels, and home dec prints are in the bottom left and center stacks, with multicolored quilting cottons on the right (I have such a hard time with that stack!). The middle shelves under the bench hold some WIPS and precuts, along with my AMH stash! Thread, bobbins, and some other special fabric stacks live in small shelves on top here. 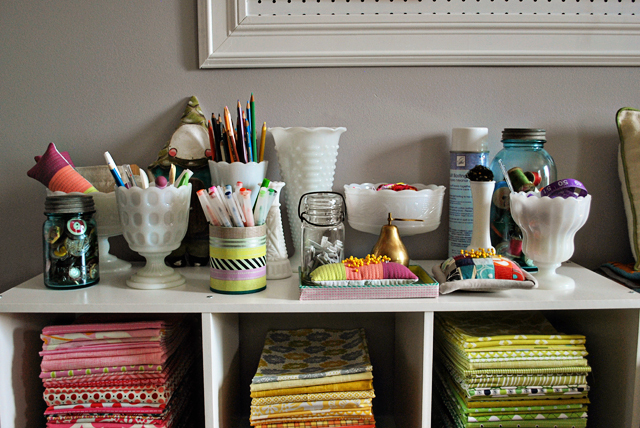 Notions, markers, and other things I use a ton are all organized in milk glass containers on the top of my shelves. My scrap bin, binding, zippers, and more thread live on the other side. On top of the bench I've got my spool pillow, ruffle quilt, and an amazing crewel pillow I thrifted recently. 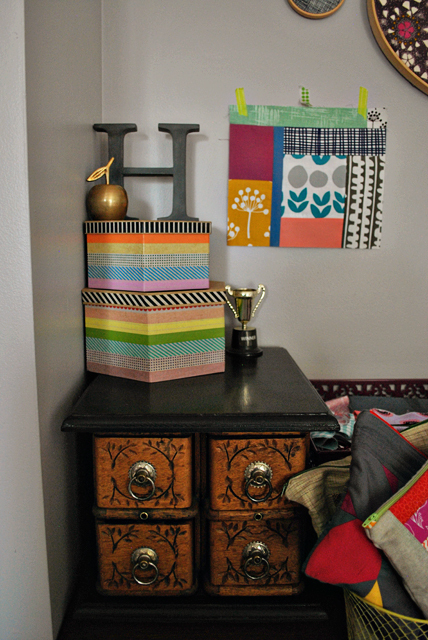 You can also see my washi tape and twine collection more clearly in this picture! The sides of my cutting table provide a ton of storage too! This side holds my stationary, camera supplies, paint swatches, notebooks and patterns. The other side holds my vintage sheets, thrifted fabrics, and work stuff. The top of my dresser provides even more storage, with bins for selvages and WIPs, and a basket full of pouches holding different handwork projects. My AMH flannels and voiles and some finished items sit on this cube next to my dresser. The bins below hold my ribbon and even more craft supplies. My little tv is also over here, but I rarely watch it! I much prefer music to watching tv while sewing. I think that about wraps up the tour! I kind of feel like a hoarder after writing this post :) I have a ton of fabric and crafting supplies, but it's all pretty organized! This room will likely evolve over time just like any other room, but for now I'm calling it finished. 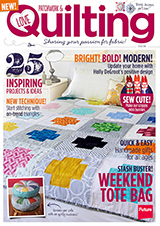 Hope you enjoyed the peek into my sewing room! If your cutting board doubles as your machine table, do you stand to sew? Or do you have a stool tucked away somewhere? It looks like that would be too high for the chair at the computer desk. Gorgeous! 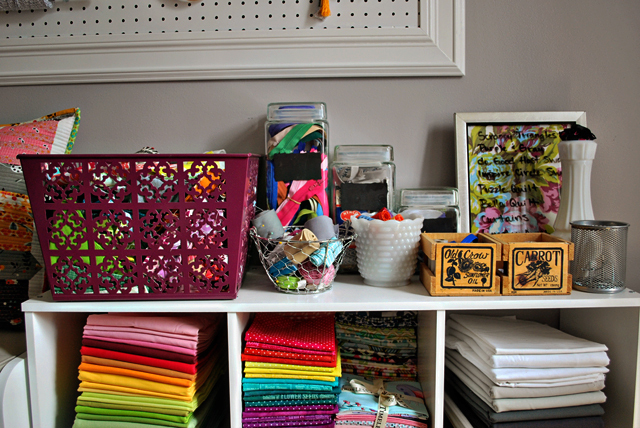 I am so jealous of your organized space :) Question: Where did you find your cutting table? I am using an IKEA dining table at the moment, but I would love to switch it out at some point. Your room looks great! I'd love to have that much creative space. I was also wondering if you stand when sewing? It looks amazing! I was also wondering what you sat on to sew? I can only imagine what's in the walk-in closet?! What an amazing and lovely space to work in. 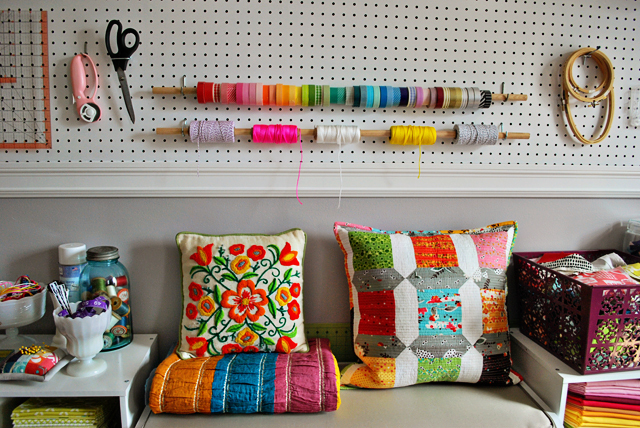 =) I like that spool pillow too! Great colors everywhere! i LOVE seeing set ups like this!! we have the same machine, so it's really fun to see your table, etc. the room is beautiful! do you ever wish to have a table where your machine would be flush with the surface? What a gorgeous, gorgeous room! 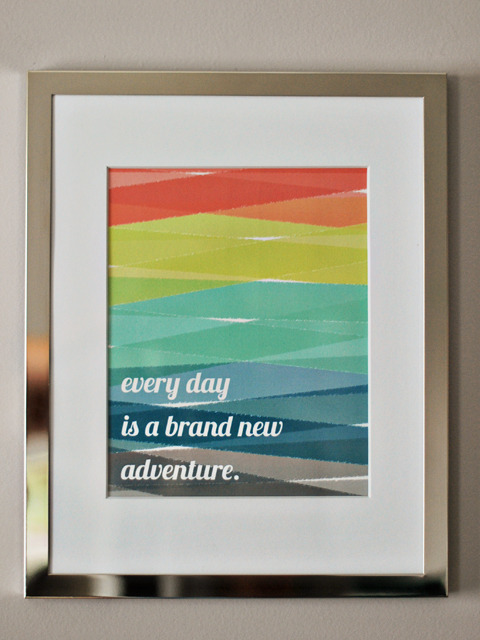 I love all the color and creativity you have in here -- someday I want one too! i love it holly! it's so organized!! I just finished repainting my sewing/playroom space, in gray no less. It's nice to have a clean space! I love your space! 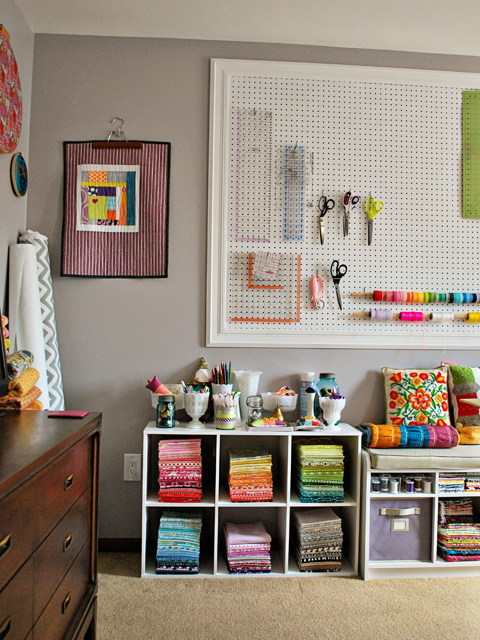 The pegboard is definitely something I need. My templates are always in the way laying on the cutting table. I love all the room you have to hang things there - such a great idea. oh, it's just so lovely and inspiring! 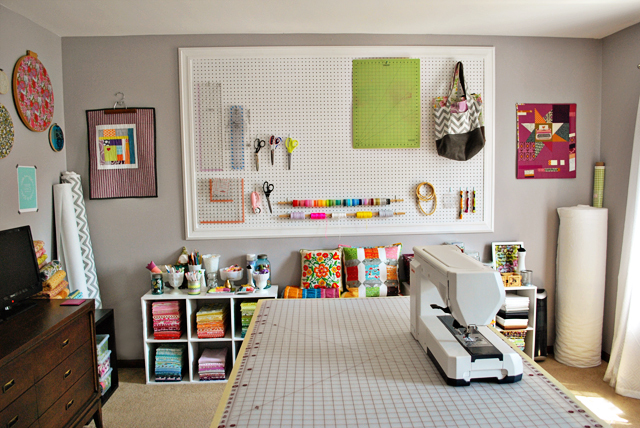 i love that pegboard, and your embroidery hoop fabric art, and your fabric storage, and your cutting/sewing table... okay, i love it all. 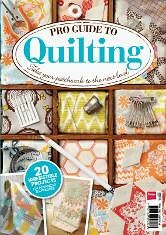 makes me feel like i should get my sewing room in order. it's a bit of a shambles at the moment. What a lucky girl to have such a fun space to create in! It is a beautiful quilt room. Thanks for sharing. 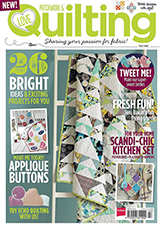 I love your sewing space! !It's seeewwww inspiring!! I can't believe how tidy it looks! I wish I could keep my sewing room (ahem I mean my dining room) in such state! I just don't have the patience to put everything back in order after finishing a project! 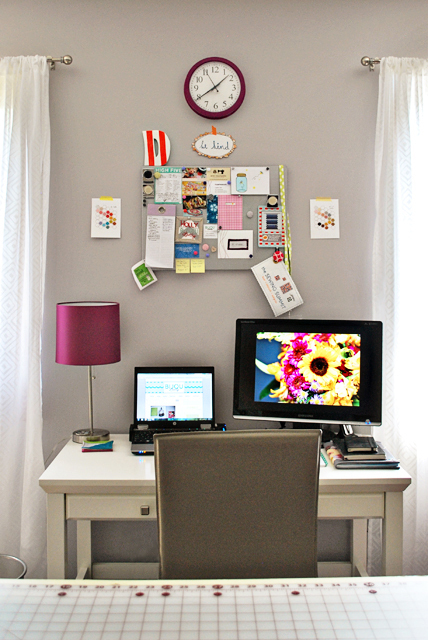 Your set-up is gorgeous and so well organized! Love it! Ok, best room ever award! Seriously, I love your space. It's so white and airy besides being filled with beautiful things. Thanks for this tour! 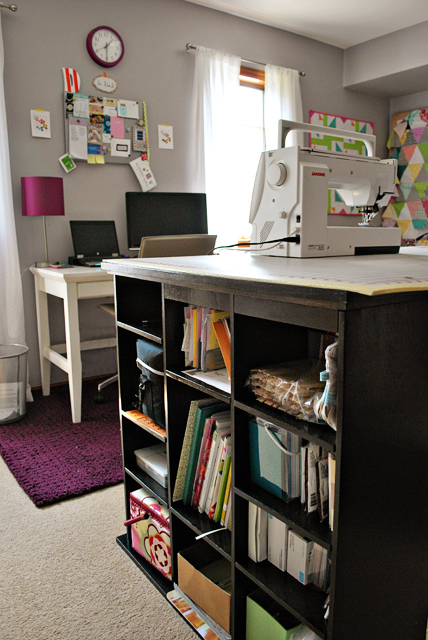 what a great sewing space, Holly! you make me want to go into mine and spruce it up.. i´ll start tomorrow.. probably :-) thanks for sharing!! What a fabulous space. Enjoy! What a BEAUTIFUL space Holly! Converting the closet space into a design wall is genius! What a lovely room! 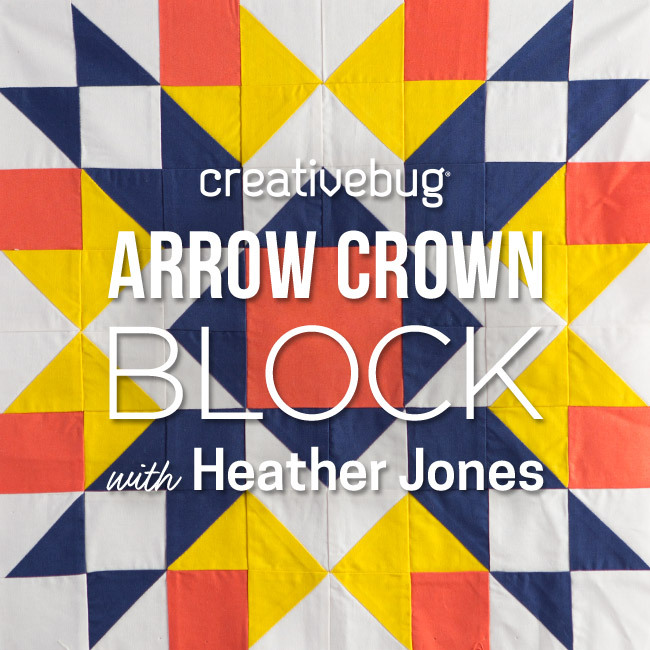 I especially like how the fabric colors really pop against the neutral background. I just stopped by from MBS. Such a pretty sewing studio! 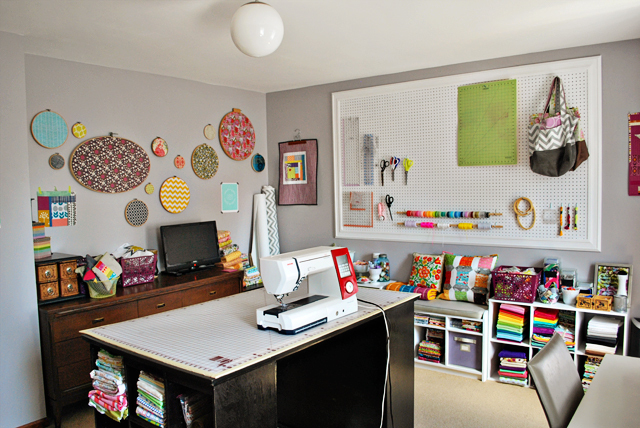 BEAUTIFUL sewing room! 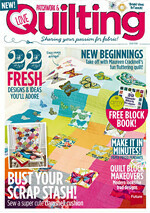 I'm a bit jealous, but you've given me some inspiration :) Found your link on Moda Bake Shop's Stash Linky page. 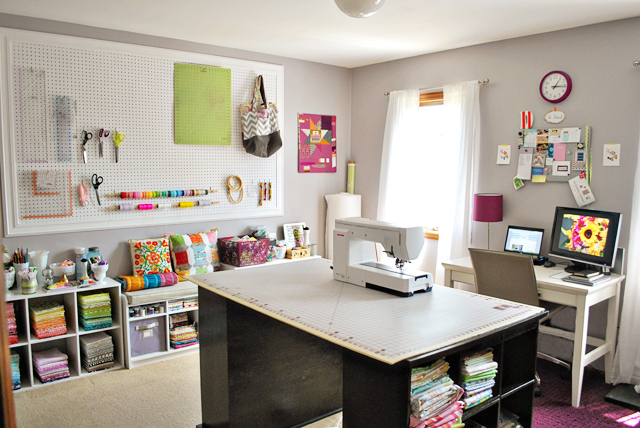 Holly, your sewing room is AMAZING!!!! What a fabulous place to work and be inspired!!! I love that your hubby has contributed so much to your dream space, too. Thanks for sharing! I really like the design of your sewing room. It is very funcional and very inspirational. I really love it.